Rich Mountain Road begins in Cades Cove. It is a one-way, dirt road up the mountain, but the views are gorgeous; especially in the Spring. You can see all over the Cove during the drive. Rich Mountain Road isn't a very well-traveled road, but, if you're not interested in going around Loop Road, it is a nice alternative. You are making me miss Tennessee so much...I'd move back in a heartbeat! We still have snow on top of our Mountains. Hi Mary. 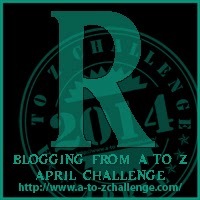 Just5 doing some blog hopping and checking out some other AtoZers. Beautiful photos . The road less traveled offers wonderful views! I think I would want to drive it! Another one I haven't seen.